Exactly one year ago I opened the doors to welcome our attendees to a weekend of creating more happiness, joy & play in their everyday. It’s been a year of gratitude, courage and vulnerability. It’s been a year of challenge, hard work and jumping into the unknown. It’s been a million baby steps, dancing with fear and overcoming. It’s been one of the greatest joys of my life. 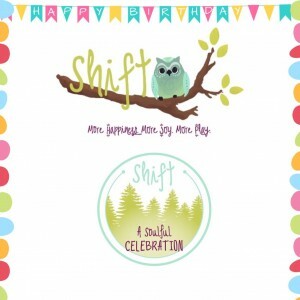 You see, SHIFT is part of my own shifting. For many years I knew I wanted to create an event that created positive change but I didn’t believe in myself. I wasn’t brave enough to shine my light on the world. I was going to have to go through my own journey to get there. I spent the next 1.5 years doing deep soul work, learning my worthiness and discovering my purpose. The time had come to be brave, believe & trust. In November 2014, I said it out loud. “I’m going to do this!” I was about to embark on a journey to make my dream come true – an event that created positive change. I was terrified and excited. I didn’t know if I could even sell one ticket or if people would even want to come to the type of event I was dreaming of. What I did know was that I would never know unless I tried. Emotionally, the stakes were high. What if I failed? What if no one wanted to come? What if I didn’t sell one ticket? What if people came and didn’t like it? There were so many ifs. A wise woman once taught me ‘let it be easy.’ I tried really hard to be in that head space before I launched the event to the world. What if it was successful? What if lots of people wanted to come? What if I sold all the tickets? What if people came and loved it? It felt foreign to think this way but it kept me from being swallowed by the fear. 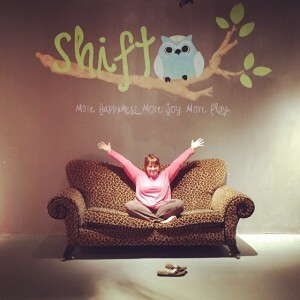 SHIFT pushed me outside my comfort zone at times. I learned to ask for help and ask for what I need. I also learned to accept help – not an easy task for me. It helped me to trust and showed me that I could do more than I thought I was capable of. It taught me collaboration, determination and love. There was kindness that brought me to my knees. None of this would have been possible without the help, love and support of some very special people. Whether they shared their wisdom with me & attendees, helped behind the scenes, helped on scene, shared creatively, sent flowers & special cards, believed in me, dried my tears or shared in the cheers, I could not have made my dream come true without any of you. My heart is filled with gratitude. Thank you for being part of the dream Matt, Beck, Linda, Lori, Marie, Jenn, Ashley G, Bri, Heidi, Gemma, Michelle, Lesley, Ashley A, Peter, Sandra, Joanne, Lauren, Scott, Manda, Donna, Emily, Waymatea & my soul sisters, Alex, Mark, Aly, Karl, Todd, Paul, Kaitlyn and the 45 women (some who have attended more than once!) who traveled from near and far, that believed in the event enough to want to attend. For everyone who helped to spread the word and shared the love. To the businesses who shared Joy Swag so generously: 4 Cats Arts Studio Summerside, NVEI, Danielle March, She Does Create, Love Squared Designs, Fearless Hart, Vision Icon, Marie Tower Nutrition, Gemma Stone International, Precious Malas & The Crystal Ranch. From the depths of my soul, thank YOU!